Camping, by its modern definition, is an activity associated to accommodations in the outdoors. It doesn’t matter whether it’s under the stars, in a tent or in a half million dollar motorhome, we still call it camping. Camping has gone through huge changes since I was a kid. The first big camping trip I can remember vividly was my, and my brother`s, first real introduction to my soon-to-be stepmother. I might get some of the specifics wrong, and Mom, if you’re reading this, remember I was only 6. My Dad, I guess, had thought it would be a good bonding experience to camp and drive across Canada to see my Uncle, Aunt, and Cousins in Ontario. From the best of my recollection, it was in a turquoise, four-door, 1972 Datsun 510 (which I think was my Mom’s) and an old style Coleman canvas tent. I asked her some of the specifics and she reminisced, “It was two weeks with a long weekend, and your Dad and I took turns driving. We tented most nights and I re- member sleeping on the beach at Lake Superior in Ontario because the one campground we found was full, and everywhere you looked were ‘no overnight parking’ signs. We slept in the car for a couple of hours and you boys were asleep in the back seat. People didn’t worry as much about seat- belts back then. I packed camping gear solid between the front seat and the back seat and spread out sleeping bags to make a flat bed, and you boys faced sideways with pillows behind your backs against the back doors, locked of course, facing each other. We played many car games and sang songs along the way. Lots of fun”. I’ve heard my Dad say many times that it was Mom’s trial by fire, for if she could put up with two boys for two weeks in a tent and a very small car then she was ready to be a stepmother, or as I like to call her… Mom. What we now call ‘recreational camping’ started around the turn of the century with the first commercial campground being on the Isle of Man which opened in 1894. Up until that point I imagine you only stayed outdoors if, A: you lived outdoors and, B: if you were on a trip between destinations with no hotels or roadhouses. I assume the word ‘camping’ comes from the words ‘to make camp’, which, from old French and Latin, means ‘to live temporarily’. When I was young, camping meant ‘roughing it’; sleeping on the ground, cooking over a fire, hiking for hours, going to bed at dusk, and waking up at dawn. When I joined Boy Scouts and then Cadets I looked forward to the weekend camping trips, no matter whether it was Spring, Summer, Winter, Fall, a heatwave, downpour, or minus twenty, I was there and loving it. After high school I joined the military and got to camp for a living; a little different, more stressful, and less leisurely, but it was still temporary outdoor living. As I got older, the allure of roughing it became less and less. Both my wife and I have said after going camping, that it really isn’t as relaxing as it should be. It’s a lot of work to get the motorhome ready to camp. You have to fill it with gas, water, food, clothes and other necessities for relaxing, such as books or games, fishing rods etc. Once you get to your spot after driving for a while, you have to park just right, level the motorhome then plug everything in, pull the awning down and put out chairs. Now you can relax… wrong. It’s now all about food; preparing and cooking. It doesn’t seem like you have gotten done with one meal when you have to start thinking about the next one. By the end of the day you are too tired to do anything other than climb into bed… early, then up early. Once your weekend is over you now have to empty everything out; waste tanks, water tanks, food, clothing and things you need in your permanent home. In a lot of ways, it might be that RVing is not basic enough to be considered camping, but I’m now at the age where I prefer the 5 star resorts to the tent. I have been reading a lot about a new trend for the more affluent called ‘glamping’, or glamourous camping. It is camping without all the work. Your tent or outdoor accommodation is already set up for you. Meals are cooked for you, more often than not by high end journeyman chefs. The dishes are taken care of, your beds are set up and all you have to do is relax. There are glamping locations all over the world, and they range in price from 40-50 dollars a night, to more than a couple thousand. 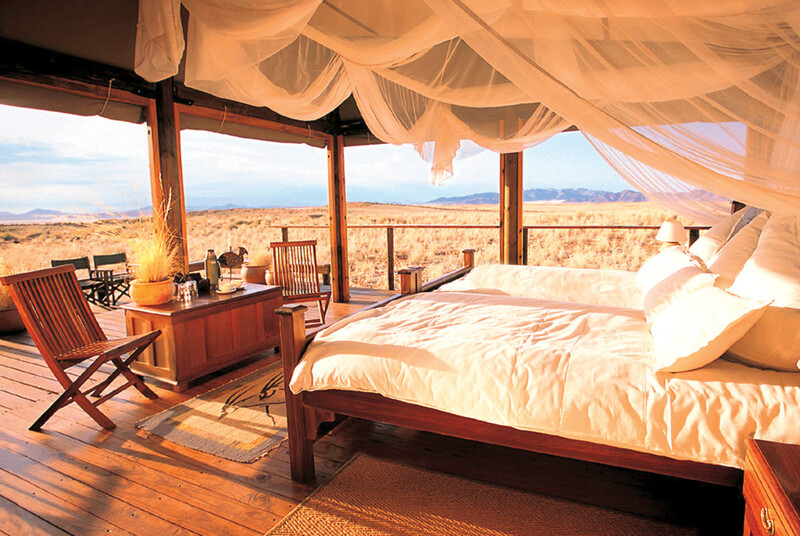 Glamping is not something new, but something newly rediscovered. It has been an activity since the African safaris back in the early 1900s when the British and American aristocracy would go on these excursions with many servants to cater to their every whim. Now you can have that same experience, if you are willing to pay for it. It will be a while before I can afford it, but the allure of an African safari has piqued my interest. Traveling across the Savanah in a Land Rover, photographing lions, giraffes and zebras during the day, then going to the camp at night. Having a gourmet meal and a glass of fine wine while listening to the sound of the neighbouring animals. Finally retiring to my tent, which has already been set up, and drifting off to sleep with- out having to think about dirty dishes, or what needs to be done in preparation for traveling to the next camping spot. I think now that I have written this article, the only thing left for me to do is start saving for my glamping adventure in Africa. It might be a few years, so in the meantime maybe I’ll go back to a tent. Have a great summer, and I hope you enjoy some camping adventures in the next few months.